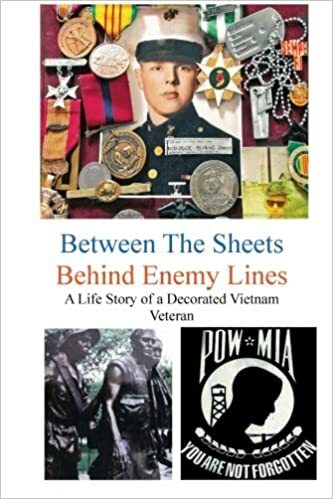 Michael J. McCormack, the author of Between the Sheets Behind Enemy Lines: A Life Story of a Decorated Vietnam Veteran (CreateSpace, 396 pp., $19.99, paper; $19.99, Kindle), served as a Marine in the Vietnam War. He “was born into a poor family in the Irish slums of Chicago and still went on to become a self-made worldwide journalist,” McCormack tells us. His father and grandfather were both Marines, but growing up McCormack was a screw-up and always in trouble with the law. He thought there was no hope that he could be a Marine. But a Marine recruiter thought differently. With a main character called Clancy and lots of dialogue, the book reads more like a novel than a memoir. In it, McCormack explores the extremes of his life, often using extreme and frowned-upon language. His references to people of color are mostly phrased in ways that would cause eyebrows to be raised in polite society. He makes the point throughout the book that he is not a person who came from polite society, nor does he seek to occupy a place there. PTSD is often discussed, usually as it relates to the behavior and failings of the author. He was also plagued with eczema for which he had expected to be forgiven military service. That did not happen and caused him much resentment. John Wayne gets discussed way beyond the usual mentions and the phrase “baby killers” is used more often than in any book I’ve read. Agent Orange is discussed, as is Bob Hope and the Vietnamese custom of using their feet to wipe their butts after defecation. That’s another new one on me. The book is not well proofread. “Land mines,” for example, appears as “land minds.” According to McCormack, African Americans can’t swim and flak jackets are “flat” jackets. This entry was posted in African Americans, Electronic Book, Memoir, Nonfiction, PTSD, Vietnam War, Vietnam War memoir and tagged Between the Sheets Behind Enemy Lines, Michael J. McCormack, Vietnam War memoir by vvaposted. Bookmark the permalink.